Guacamole: Cut avocado in half (vertically) and scoop out avocado with spoon. Mash with fork. Add salt and pepper, garlic, onion, tomato, lime juice and diced jalapeños. Heat a grill pan on medium heat. Butter two pieces of bread. Place the buttered side of the bread down on the grill pan. Put a dollop of guacamole on the bread pieces in the pan and top with cheese slices. Butter one side of the two remaining pieces of bread. When the cheese starts to melt, place the unbuttered side on top of the cheese slices. Flip sandwiches as needed. Serve immediately! In my arsenal of food favorites, guacamole and cheese are shining beacons of foodie delight. Clearly only a genius would combine the two to make a warm and gooey grilled cheese sandwich. That genius was in fact, the creative minds behind Two Peas and their Pod blog who paired spicy guacamole with cheddar cheese to make a scrumptious grilled cheese. I made a version of that sandwich using Old El Paso jalapeños and serving it with a side of Food Should Taste Good chips. Enter the Spicy Guacamole Grilled Cheese Sandwich. First step to this spicy guac is to mash your avocado and mix with the typical lime juice, salt, pepper, onion and minced garlic. To give it an extra kick, add Old El Paso’s sliced jalapenos (bonus, you don’t have to seed a jalapeno pepper yourself) found by the taco accessories at your local g-store. Heat up your grill pan (hand down the BEST way to make a grilled cheese, btw) and while it’s heating, snack on your guac with Food Should Taste Good tortilla chips. The hearty chips will hold a mound of guac! (Also, don’t throw away your avocado skins, use them for a cute salad presentation! When the grill pan is heated, lay down two pieces of bread on the pan and top with a dollop of guacamole and follow with cheese slices. Butter two other pieces of bread. When the cheese starts to melt, top with the buttered pieces and flip sandwiches as needed. When the sandwiches have those beautiful grill marks on either side, you know they’re done. 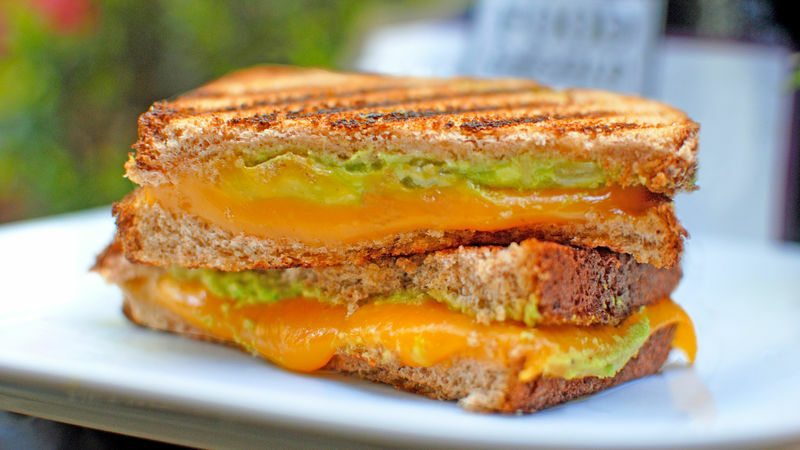 Eat immediately to enjoy the spicy guac grilled cheese as soon as possible!